Cultural norms are the standards we live and work by. They give us a reasonable expectation of how other people will behave and allow us to act in a way where we can understand the reaction we are likely to get from other people. We may not always agree with every cultural norm but at least we know what the likely reaction will be if we choose to breach it. Countries, regions and religions will have their own cultural norms and most organisations will develop their own. One of the main benefits of cultural norms is reducing uncertainty. Most people hate uncertainty and will often choose a less than perfect status-quo rather than face an uncertain outcome. This causes real problems for new leaders seeking to change organisation cultural norms. Not only are people facing real uncertainty over a change of leadership but now they are also facing the uncertainty of doing the wrong thing culturally. These challenges are shown really well by the article referenced below where the incoming CEO of SoftCat, Graeme Watt played an April Fool's joke on his new company sending out an email about changes he wanted made. This included changes to the company's support of charitable activities and a change to the dress code. Although Watt's email was only a joke, the reaction from some of his employees, particularly to the cultural norms around dress, illustrates some of the challenges of top-down cultural change coinciding with leadership change. Another frequent example of this in action is when a change of management takes place at a football club. The new manager will often try to effect cultural change to achieve his goals. My own team, Ipswich Town, recently appointed Paul Hurst as manager and he has made it clear in the media that he expects a change in culture - particularly around the player's attitude to fitness. Media reports would suggest this has caused some disruption amongst the players and whether it will be effective remains to be seen. 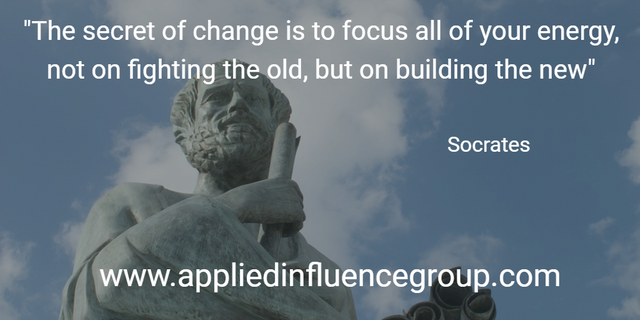 So what are the influencing tactics that new leaders can use to affect cultural change? Changing a cultural norm requires leaders to break from the norm themselves. If it's changing the cultural norm around an organisational dress code they need to start dressing to the new standard they expect. If it's altering a culture of working excessive hours, they need to be working fewer hours and not conducting business activity outside of these. Whatever the change that's required, the leadership need to visibly demonstrate that they are doing it themselves. Leveraging authority can be a key tool to effective influencing but it isn't always the most appropriate. When a leader is newly in-post, leveraging authority can end up being more divisive than positive. That's not to say a new leader shouldn't exert authority but more that he or she should be careful about doing it when trying to change cultural norms. Getting a few individuals at a lower level within the organisation to start demonstrating the new cultural norms you want, can be highly effective. This video is a great example of the idea of the importance of the first follower. Showing yourself to be adopting new cultural norms is powerful; showing that others at a lower level are adopting the new cultural norms is much more powerful. Any change can be a threat to individuals until they realise it isn't. A change to cultural norms is no different. Even something as simple as a change to the dress code can make people feel threatened depending on what they fear. Individuals who are strongly motivated by a desire to fit in, may be fearful of what other people will say about their new, unfamiliar clothes. Footballer's being asked to adopt a new cultural attitude towards physical fitness may be scared that it will exacerbate an old injury. Whatever the fears at play are, showing you understand them and mitigate against them, when appropriate, can help to effect the change you want. We like rituals and it's surprising how quickly a new ritual can take hold. Repeat something more than twice and look at how quickly it becomes 'the tradition'. This works better for small acts that require little planned effort but often these can be a way of reinforcing the change you are after. The act of completing the ritual becomes a subconscious commitment to the main aim. Let's take an example of trying to change a cultural norm where it's acceptable for people to look at their mobile phones during meetings. The leader who wants the cultural change demonstrates the behaviour they are after. This means that without exception they don't use their mobile phone during the meeting. Get one or two other regular participants to buy in to the change and begin to demonstrate the change that's required. As with the leader, they can't make any exceptions to the change. This is the first follower in action and makes it acceptable for others to adopt the new behaviour. Understand legitimate fears over not being able to view their phones. This could be business related e.g. "I'm waiting on an urgent message from a client" or personal e.g. "My child was a bit unwell and the school may ring". Find ways to mitigate the fear. This could be scheduling a one minute phone check at the end of every agenda item or every 30 minutes. Create a new ritual. This could be as simple as whoever looks at the phone first has to buy the coffees at the next break or having a 'phone box' that everyone puts their mobiles in when they get to the meeting room. Whatever it is, it has to be done consistently, preferably with good humour and it will quickly become a 'tradition'. Changing cultural norms is possible. It's also possible to do it without creating some of the tension and conflict that can come from top-down edicts. It's also not always necessary; what Graeme Watt's April Fool joke showed was that he understood and bought into the existing culture at the company he was taking over. Among the points outlined in an email to Softcat employees was an introduction of directors parking, because it is "inefficient that I have to go out for a meeting and have to look for a parking space when I come back"; and a dramatic reduction in charitable activities because "while I applaud the amount of charity work the company does, it seems like we were spending too much time on these initiatives - and time is is money". Other outlandish suggestions included installing a bust or portrait of now-chairman Hellawell, and a ban on casual clothing - which was the most controversial point among those who fell for the prank. 🗣 "It's a new era and a key part of my vision for the Club is to create an innovative and modern culture in the way we operate." We were told that Paul Hurst is a man not afraid to upset the applecart.